*and offset the bars from there. But that all takes way longer than something that should be so simple, and as we all know time is money. so anyone got an idea? I tend to use a lot of constructions circles with equal diameter and tangent constraints. In your case, I can see 3 different size circles each dimensioned to manage the desired result. ...what are those E1 and E2 dims? the e1 dims are a result of me telling Creo that dim2 &dim3 = d1 using the = button in the constrain tab. 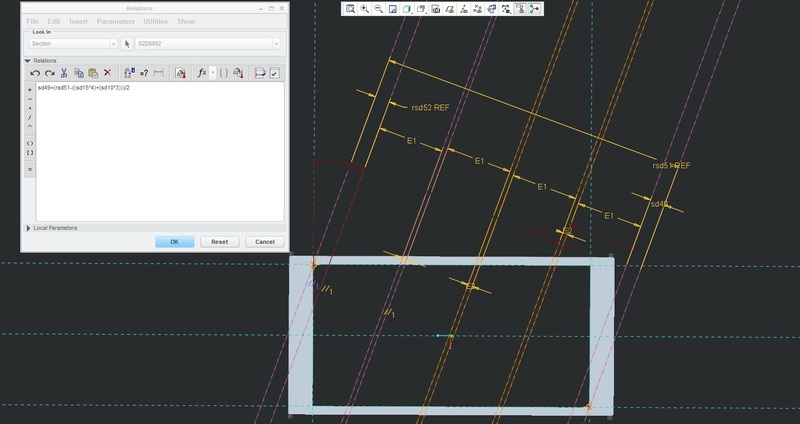 It looks like your dimensions 29.3 and 27.2 are actually each dimensioning the length of a line entity... can't you just set an equal length constraint on those two lines? Your sketch is over constrained. By constraining the outer construction lines to the corners of the rectangle, you can't control both the 8, the 120, and the 29.3. Something has to give. 1.) Temporarily delete the corner constraint. 2.) Dimension the distance between each outer set of construction lines. 3.) Set these two dimensions equal to each other. 4.) Delete the remaining outer dimension. The two outer sets should still be equal to each other, but no dimension. 5.) Re-constrain the corner back to the line.